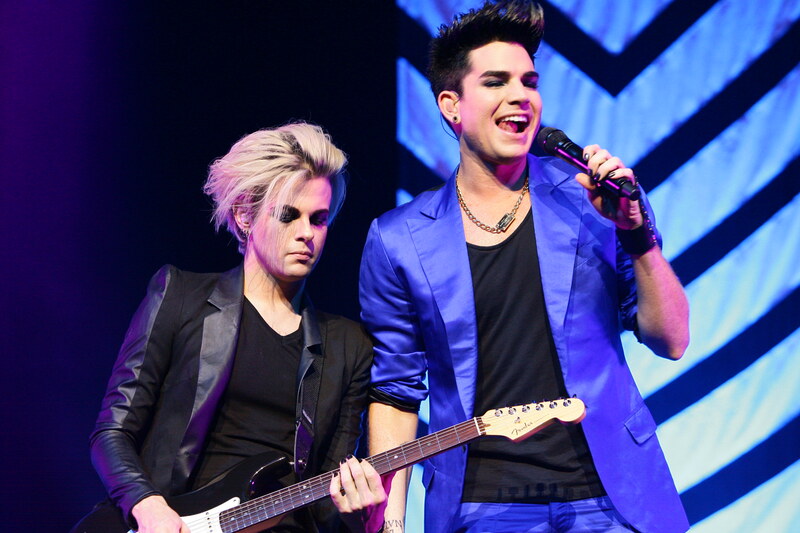 Adam Lambert, seen here with his guitarist Tommy Joe, hits back at his critics. It took nearly three-quarters into the 90-minute concert for Adam Lambert to hit back at his critics, but boy when he did, he hit back hard. "Someone asked me in an interview, 'Are you promoting a certain lifestyle? 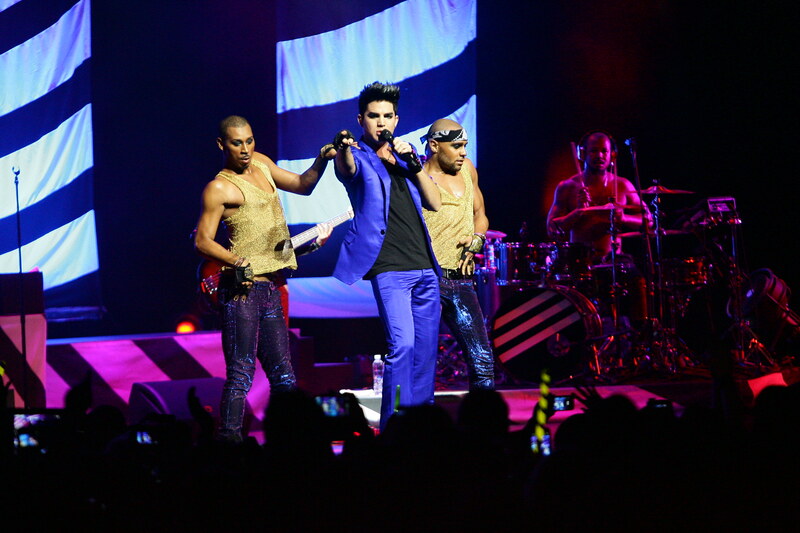 '", said the openly gay glam rocker to an audience of about 4,500 at the cavernous Star Vista theatre on Friday evening. "My answer was, 'The only lifestyle I am promoting is one of love and friendship, music, joy and fashion. So whoever wants to be part of that lifestyle, yeah, we accept anybody," said the 31-year-old to raucous applause. And that was that, as the former "American Idol" alumni put the final nail in the coffin on his detractors, who had raised a week-long ruckus why he was being allowed to performed at a venue owned by Rock Productions, the business arm of New Creation Church. Pity it took that long for the delightfully camp entertainer to address the elephant in the venue because from that moment on, it seemed the shackles came off and the concert really went into overdrive. Every pirouette, hip thrust, bootie shake, finger wag and shoulder shimmy from that moment on was greeted by pure glee by his fans -- young and old, gay, straight, lesbian and bi, with friends or family and across all races. Earlier on in the evening, Lambert - dressed in an electric blue suit, the first of four costume changes -- burst onto stage at the nearly-full theatre at precisely 820pm, kicking off with uptempo "If I Had You". With a simple stage set-up that put the focus squarely on his six-piece back-up band and his performance, he raced through his 20-song setlist. Arguably the highlight of the first half of the show was a haunting stripped-down version of his 2009 hit, "Whataya Want From Me?" (to which his fanatical army of "Glamberts" shrieked "Everything!"). The control and poise of his soaring, multi-octave vocal range that took him all the way to the final of "Idol" Season 8 was breath-taking, and it was clear for all to see that the eye-lined glam rocker has grown leaps and bounds as an entertainer since his TV debut. There were other delightfully risque moments, such as when he cavorted with his two male back-up dancers, Johnny and Terence, in "Fever" ("Do you like what you see?") but being the consummate entertainer that he is, Lambert knew not to cross the line. Through his four-costume change during the concert, he was at times serious, cheeky and camp as he playfully vamped it up on stage and much like his 2009 hit "For Your Entertainment", he played the role of circus master to perfection as his fans lapped it up. Downsides were far and few between, among them perhaps the fact the cavernous three-level Star Vista theatre may not be entirely conducive for a rock concert because of the stage and sound set-up. Then came his "Music brings us together" moment during the "Shady" interlude and all was forgiven. Even though he obliged his fans with an encore at the end of the concert, that was hard to top and the fans went away satiated. "It was the most amazing show ever. I've loved him since "American Idol" and I enjoyed every second of the show -- his vocals, his dancing, his fashion sense, everything," said a breathless Atiqah, 24, who was there with two of her friends. "Yes, it was too short. I wished it was longer," chimed in her buddy, Hanis, 23, a customer service officer. "He was just a darling, and the concert was really, really nice. You can see he likes to perform," said a Singaporean in her 50s who simply wanted to be known as Renatee. "Sometimes you have to forgive others and accept others the way they are," she added, in reference to the week-long controversy preceding the concert. Her husband, who declined to be named, agreed. "Lambert's message is clear. He is promoting a lifestyle of tolerance and friendship and love -- the exact core values a church is supposed to promote".